1. For the past ten years, which is all of my married life, I have been in charge of bringing pretty much the same things to every family gathering. Notice a trend? NOTHING BAKED OR COOKED. In other words, dear Ginny, please, just go to the store. Don’t try to cook anything. Don’t try to bake anything. Unplug your microwave. Unplug your stove. Don’t even LOOK AT YOUR STOVE. Block every kitchen entrance with crime scene tape, please. There’s even a running joke in my family about “cups and ice,” if you remember the Friends episode where Phoebe was put in charge of cups and ice. That’s me. Cups and ice. But early this year, I found the Pioneer Woman’s site and she has taught me so much. I’ve made Curry Chicken Pasta Salad. I’ve made apple pie from scratch. I’ve made peach cobbler with maple cream sauce. I’ve made raspberry lemon bars that my Mexican niece hoovered. I’ve cooked and baked and through trial and error (let’s not talk about the worms I found in my first batch of cobbler or the time I thought a “scant cup” was a totally made up thing), I’ve managed to not kill people with my baking. In fact, I’m getting pretty unsucky at it. So this year, I’m making a real pie and homemade Parker House rolls for the family Thanksgiving meal. I expect them to be delicious and non-poisonous and worm-free, but just in case, alert the ERs to have their stomach pumps ready to go. 2. I don’t do Black Friday. Getting up at 3:00 a.m. to shop is my idea of hell. However, I can totally get behind THIS Black Friday sale! 20% off your purchase at BelieveMerch on Friday! 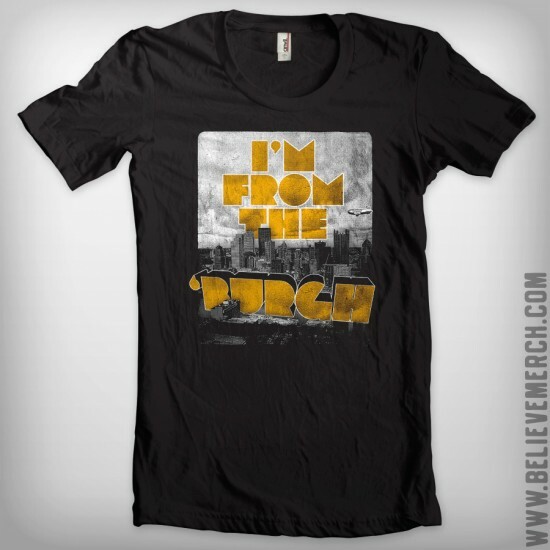 Check out the “Defend the Confluence” and the other “I’m From the Burgh” shirts as well! The owner of Believe Merch donated a bunch of shirts to Ti Kanaval so we like him very much. 3. Speaking of holiday shopping and Pittsburgh gifts, WildCard in Lawrenceville is holding a fun event on December 10 from 5-8 with expanded gift selection, free beverages, Christmas-movies and more. They’ve got TONS of awesome Burgh shirts, and they carry some of the BelieveMerch shirts as well! 4. Eat n’ Park, who you know I criticize for being overly litigious, is doing a good thing for SICK KIDS and that means I must tell you about it! For the SICK KIDS! $2 buys you a ticket for a chance to win a Ford Fiesta, with all proceeds here locally going to Children’s Hospital of Pittsburgh, and also you can check out their blog where they’re posting the daily events they’re holding that also will benefit the Caring for Kids campaign. 5. Speaking of Eat n’ Park, the Eat n’ Park girl has a website and apparently she’s living in Nashville where she’s working on a budding country music career. Who knew?! Her name is Sarah Marince, she’s from Moon, and shoot. I kinda love her song that plays when you visit the site. I DON’T WANT TO LIKE HER. But I do. 6. You have until Thursday to use the PASODOBLE code to get $15 off tickets to select showings of Burn the Floor, the show I saw in Philly. And now I’m reminded that I’m supposed to be hard at work on acquiring a set of defined abs on my body. 7. Here’s another Awesome Burgher doing Good Things. Hunter Berk, 18, from O’hara Township! Hunter Berk sits in his basement knee-deep in college prep books—essay writing guides, AP flashcards, SAT prep manuals, and college directories. He sorts them based on their condition (some have been written in but most have not) and packs everything up in his car to drop off at Fox Chapel Area Senior High School. Hunter’s efforts are part of College Bound Collection (CBC), a program he founded in June 2009 to distribute free college prep materials to those in need. Go read more about what he’s doing and then if you see him, big giant pat on the back! Proof that even if it’s a simple thing, everyone can do something good for someone else. My self-united husband Joe Manganiello in the latest issue of People Magazine’s Sexiest Men Alive edition. If you’d like to stalk Joe in person, he’s going to be at the Jets game and also at the Waterfront on Saturday. peach cobbler with maple cream sauce. Jesus, Mary and Joseph: DON’T DO THAT! You distracted me for a second from that header pic of Sarah. This post is missing pictures of Sumire and/or Gina. Saw Sarah at the Boy Scouts Campaganza in September. She was a huge hit. Gah gah kids everywhere. She was so NICE too. Go Sarah! Talk of baked goods and that shot of Joe in one post. My hormones just exploded. Am I the only heartless grinch-y type that giggled just a little at the idea of giving used SAT prep books to the underprivileged students in . . . Fox Chapel? preemptive flame retardant: I know not everyone in the borough is rich as Roosevelt, but I mean, majority-wise . . .
Kinda sick of all the hype that the Eat N Park chick gets…ordinary 11th grade choir voice, add auto-tune and the NashVegas hair/makeup/ward robe and he have another pop-tart (just like Taylor Swift). Meanwhile, arguable one of the finest bands to ever come from Pittsburgh played a reunion show this past weekend – GATHERING FIELD…and they got almost ZERO press. Too bad, Bill Deasy and the guys are amazing and have a fine collection of songs. Rant over….let’s go PENS….Tanger is on a rip ! Woot !!!! LeTang Chan. My husband and I have been in charge of rolls for all holidays for ten years. And we actually CAN cook now! I actually requested to bring a side dish to my mother’s house this year for Thanksgiving, and I’m so excited to “prove myself”! Regarding Thanksgiving Foods…my wife and I were “assigned” rolls and fruit salad by my MIL…Last two years I’ve made some killer pumpkin cheese cake with chocolate crust and ganache top but hardly anyones eats it (it’s not “Traditional”…”too fancy” is all I hear….geesh, it’s 2010 folks, head your head out of the Ward and June Clever era, huh ?….sorry, I digressed)…. Thanks to you, Ginny, I’ve also become an ardent follower of The Pioneer Woman. I’m a fair cook, but not much of a baker. Amazingly, she has taught me to make pie crust, a previously unattainable skill. I was thinking, too, that the parkerhouse rolls on the website look totally doable as well. (Did you see her with Bobby Flay doing a Thanksgiving Dinner “throwdown” on The Food Network last week? She rocks!) Bakers, start your ovens! My wife is attempting her first ever Thanksgiving dinner. We would usually go to my parents for Thanksgiving and her mom would cook a gruesomely huge meal, a week later, after her Dad would get back from hunting camp. Since her mom died in April, she wants to take care of her dad by cooking him dinner so he’s not all alone. And man, I really need to step up my Pittsburgh gear offerings. I bow down to BelieveMerch. I thought the exact same thing, but as I was too busy (lazy) to read the whole article, I thought I may have missed something there. “Under-priveleged” and “Fox Chapel” don’t really go together, do they? OK, I’ll eat crow on this one…the College Bound Collection is only stored at FCHS, but is accessible to any student from any area school. That is a really nice thing for Hunter to do. True story – I used to live in Moon, and when I would shop at the local Giant Eagle, Sarah’s picture was always up on the bulletin board as you walked in, touting her as a local music sensation. Little did I know that she’d actually kinda, sorta make it in Nashville. Good Lord. That pic of Joe is going to cause an estrogen MUSHROOM cloud. And that’s just from me! Just wanted to say the I love the Pioneer Woman too! She rocks just like you! Beth beat me to the estrogen cloud reference. And, although I’m not normally a conspiracy theorist, I find it odd that the picture of Sarah is a head shot without even teeth showing and we get Joe as the first-runner-up in the wet T-shirt contest. HMMM!! Given Ginny’s penchant for fairness, I’m sure we’ll have things evened up for the guys eventually. I just hope God let’s me live that long! Don’t mean to end on a downer, but hug your family and loved ones just a little tighter this weekend. On Friday I’m going to a viewing for a former student who left us way too young. Remember when you’re counting blessings, even the basics really are blessings. I second/third/fourth PW Cooks. Try her Penne a la Betsy and her lasagna. They are my standbys when I dare to have people over for dinner. Sarah`s pic is still on the bulletin board at the Moon Giant Eagle. Didn`t realize the EnP girl was her. She looks completely sane in the pic on the bulletin board. I’ve heard a few of her country songs and she’s actually pretty good, but as an anthem singer, I’m sorry but she is AWFUL. Awful. I am one of the lucky Twitterers who won one of the BelieveMerch t-shirts at Ti Kanaval (Sidney is my homeboy, yo) and I will most definitely be ordering some more shirts as gifts on Friday (in fact, the item my brother-in-law specifically requested from me is a BelieveMerch shirt! Those shirts are fabulous! I want! Bobby Flay recently did a throwdown with Pioneer Woman for Thanksgiving dinner on Food Network. It all looked so good! I stopped using WiiFit after my friend’s very skinny 8 year old son came over and used it on my profile, and Fitty was all, You’ve lost three million pounds! Good job! Now I can’t bear to get back on it and have it say, hey fatty! You gained three million pounds! Lay off the lard, will ya? Sarah used to dance at the school where I take classes, and we saw her perform last year. She is a lovely young lady. Hope she stays that way, as her success grows. My parents are hunkering down in their house this year with Bob Evans. They refuse to go to any of our houses (don’t want to drive, don’t want to be driven) and have declared that the “old folks” are just staying home. Sigh – Catholic guilt and pumpkin pie all rolled into one. Oh and my father has declared brussel sprouts to be hari krishna food. Indeed. Happy Thanksgiving everyone! Be safe! I can relate with the bringing the rolls, ice, drinks, etc. for family gatherings. That has been my job for as long as I can remember. When hosting gatherings, I am in charge of what I call “physical plant” duties — cleaning, making sure we have enough chairs, buying the beer, last minute runs to Giant Eagle, etc. I think the “physical plant” term doesn’t make me sound like such a slacker! Loved the shirts at BelieveMerch, and that got me thinking: Ginny, what would you recommend as the “must have” gifts for a Burgher (or an ex-pat Burgher)? Are there other shirts — or other merch — you’d stand behind? Ones that you’d say HAVE to be under a true Burgher’s tree this year? Have you checked out WearPittsburgh.com? I love the Lady S’Liberty t-shirt – waving a Terrible Towel instead of holding the torch. They’ve got a good selection of shirts that are unique to Pittsburgh – i.e. – You’re the Yinz to my Yang,etc. I so love the Pioneer Woman :) She rocks – I her cookbook, autographed and all cause I’m cool like that!! I’ve never made anything of hers that was bad – the apple dumplings are one of my favorites!